Yesterday we discussed some of the reasons why the Government might want to terminate a contract. Sometimes the termination is for the convenience of the Government and sometimes because the contractor failed to meet expectations. These are usually referred to as T4C (termination for convenience) and T4D (termination for default). The Government will usually go out of its way to avoid T4Ds. When contract problems arise, T4D is a last resort, primarily because it significantly extends the completion date of whatever project or service is needed. Even if there is a performance bond involved, delays occur. Therefore, the Government will usually explore alternatives to termination. For example, the Government might (i) revise a delivery schedule, (ii) allow the contractor to subcontract some effort or enter into other third party arrangements, or (iii) change contract requirements to permit continued performance (usually with some kind of consideration on the contractor's part). Termination is not an all or nothing event. The Government can also "partially" terminate a contract. You see this when production is curtailed because of funding constraints or when there is a troop draw down in a particular area and less "support" is required. A partial termination can also be used in a T4D situation. Cost recovery depends on the type of terminations. The regulations are much more generous under a T4C than under T4D situation. Under a T4C, contractors can be compensated for actual performance to date, profit on work performed, left over inventory, subcontractor settlement costs, and settlement proposal preparation costs. Under a T4D situation, the contractor is entitled to almost nothing. Under all Government contracts, the Government reserves the right to terminate the contract. Every contract contains one or more of the clauses at FAR 52.249-1 through 10 (or FAR 212-4 for commercial items). By far, most of the contracts that are ultimately terminated are done so for the convenience of the Government. A few are terminated for default or for cause. There are any number of factors, circumstances, or conditions that make terminations necessary. Sometimes the Government runs out of money for a particular project or the requirement is no longer needed. Sometimes quantities of requirements need to be reduced (draw down of troops in Iraq). These are all situations where the Government terminates contracts for its convenience (T4C). Other T4C situations include a change in requirement beyond the contractor's capability or expertise, a significant increase in the scope of a requirement, or the impossibility of contract performance (such as sometimes occurs in Research and Development programs). 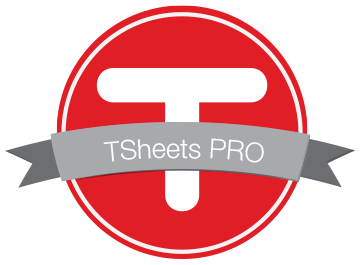 T4Ds can jeopardize a contractor's chances of winning future contracts. All such actions are recorded in the Government's FAPIIS (Federal Awardee Performance and Integrity Information System) which contracting officers consult prior to awarding any contract. If a contractor appears in that database, a contracting officer must prepare additional documentation and rationale, and solicit higher-up approval before awarding a contract. Unless that contractor is a sole source for a particular item, a contracting officer will not be able to justify award to a contractor with such a black mark. Last Friday, we discussed the CAS Board's (Cost Accounting Standards Board) announcement that it will no longer pursue proposed changes in CAS 416, Accounting for Insurance Costs. We have also learned that the CAS Board is discontinuing its rulemaking efforts in reviewing the CAS 403 thresholds that require the use of a three-factor formula for allocating residual home office expenses. Residual expenses are those home office expenses that cannot be identified specifically to a particular segment or do not have a clear relationship (measurable with reasonable objectivity) to two or more segments. Under CAS 403, contractors first have to determine if residual expenses are material. Materiality is determined by taking the residual pool and comparing it to the aggregate operating revenue of all segments, factored as follows; 3.35 percent of the first $100 million, 0.95 percent of the next $200 million, 0.30 percent of the next $2.7 billion, and 0.2 percent of anything over $3 billion. If residual expenses exceed this amount, contractors must allocate the expenses over a three-factor formula consisting of payroll dollars, operating revenue, and average net book values of tangible capital assets. These thresholds have not changed since CAS 403 became effective 38 years ago while the CPI (Consumer Price Indes) has increased 400 percent. The CAS Board was thinking that it needed to update the thresholds to reflect the changed economic and business environment since 1973. In the end, no one was able to provide any evidence that the current thresholds are creating an inequity, or that adjusting the thresholds would substantialy change the outcome. That is, the pool of contractors required to use the three-factor formula to allocate residual home office expenses to the segments would not change significantly. Therefore, the Board decided to abandon any further effort on revising the thresholds. The Cost Accounting Standards (CAS) Board published a notification in the Federal Register this morning of its decision to discontinue the rule making on the development of an amendment to CAS 416, Accounting for Insurance Costs, regarding the use of the term "catastrophic losses". This process began in the Clinton administration. Back in 2000, DoD requested that the CAS Board consider whether the word "catastrophic" should be replaced with a term such as "significant" or "very large" in order to more close align the Standard with was was intended by its original promulgators and eliminate confusion between CAS and FAR. Five years later, the CAS Board published an SDP (Staff Discussion Paper) addressing the issue. Only two respondents bothered to comment of the SDP. One of those two recommended the Board drop the issue. Neither one provided data or other information describing disputes or other problems arising from the use of the term "catastrophic". Ultimately, the CAS Board determined that since CAS 416 has been in effect for over 30 years and there has never been an issue regarding the use or definition of "catastrophic", there was no need to amend the Standard. Every Government contractor has had the experience of making representations and certifications as part of submitting a proposal to the Government. These days, representations and certifications are almost always submitted via the Online Representation and Certification Application (ORCA). The online submission eliminates the administrative burden for contractors of submitting the same information to various contracting offices and it establishes a common source for this information to procurement offices across the Government. Prospective contractors complete the ORCA in conjunction with required registration in the CCR (Central Contractor Registration) and then update it annually or more often to ensure that they are kept current, accurate, and complete. Representations and certifications are effective until one year from date of submission or date of update. The number of required representations and certifications is too long to list in this short blog post. However, a sample can be found in FAR 52-204-8. The listing includes such things as small business status, women-owned business, place of performance, affirmative action, bio based product certification, and the list goes on and on. A recent settlement in a false claims suit announced by the Department of Justice illustrates the importance of ensuring that information submitted into ORCA is current, complete, and accurate. In the case just settled, the contractor falsely claimed that it had used disadvantaged business enterprises (DBE) for part of the work on a light rail transit project in Minnesota as required by the terms of the solicitation. The contractor claimed that materials and services were provided by DBEs when they were provided by non-DBE subcontractors. The DBEs were merely extra participants used to make it appear as if a DBE had performed the work. The contractor and a number of subcontractors agreed to pay the United States $4.6 million to resolve the allegations. Under the GSA Schedules program, GSA establishes long-term government-wide contracts with commercial firms to provide access to millions of commercial supplies, products, and services at volume discount pricing. The GSA Schedules Program serves as the catalyst for billions of dollars in federal spending, helping meet procurement needs for eligible users, including all branches of federal, state, and local governments. The Department of Defense is the largest user of the GSA Schedules Program (as well as other smaller and less well-known Federal Supply Schedules). It has noted however, that the use of these schedules allow, but do not necessarily require, that ordering activities may consider socio-economic status when identifying contractors for consideration or competition for an award of an order. As part of DoD's effort to promote the use of small businesses, the Department "strongly encouraged" its contracting officers in an August 19, 2011 memorandum, to have at least two or more small businesses in the competitive mix when soliciting from Federal Supply Schedules. Small businesses that have a GSA Schedules contract (or any multiple award schedule program contract) should ensure that their size/socio-economic classifications are accurately stated in order to improve the chances for awards. The Government is required to protect contractors' proprietary information from unauthorized disclosure. There are two recurring issues regarding this requirement. What is contractor "proprietary data" and what is "unauthorized disclosure". Contractors are responsible for deciding what data is proprietary. FAR 52.215-1 provides specific language for marking information that they consider proprietary. There is specific wording for the cover page and truncated wording for each page that contains proprietary data. We've discussed this requirement and wording in earlier postings. Vigilance in protecting proprietary information is a must. Although not fail-safe, failing to include these markings greatly increases the likelihood that competitors will see your information, good ideas, indirect rates, compensation levels, etc. ... no person or other entity may disclose contractor bid or proposal information or source selection information to any person other than a person authorized, in accordance with applicable agency regulations or procedures, by the agency head or the contracting officer to receive such information. They key phrase here is "...person authorized in accordance with applicable agency regulations and procedures. If there is ever a dispute about who is or is not authorized, contractors should request copies of agencys' specific policies. FAR 2.104-4 also contains procedures for resolving disagreements between contractors (or prospective contractors) and the Government as to whether certain information is indeed "proprietary". Some companies make it a policy to mark everything "proprietary" when it is not necessarily so. This practice often irritates Government personnel, causes more work for everyone, and is not recommended. This clause does not authorized the withholding on any information from Congress, a Federal agency, GAO, or the Inspector General though if an agency releases such information, it must notify the contractor. The other day, we came across an item that illustrates the importance of prime contractors maintaining adequate oversight of their subcontractors. It involved a cost-reimbursable contract with the Department of Labor and a cost-reimbursable subcontract between that contractor and a subcontractor. Somewhere along the way, the subcontractor falsified its timekeeping/payroll records and inflated billings to the prime contractor. The prime contractor, in turn, submitted the subcontractor's "inflated" billings to the Government and was reimbursed. The scheme was eventually uncovered (not by the prime contractor but by a whistle-blower) and the Department of Labor has demanded restitution from the prime contractor. Besides restitution however, the Government has additional tools it can use to mete out justice. Consider the Government's comments addressing this situation. ...both the prime and its subcontractor's could be charged under 18.U.S.C 1001 for making false statements by submitting false payroll information. Additionally, both may be prosecuted for making false claims under the Civil False Claims Act, 31 U.S.C. 3729-33 for submission of false payroll information. Moreover the prime may be liable under the criminal statute for False Claims, 18 U.S.C. Section 287 as well. This is because both the prime contractor and its subcontractors are responsible for the accuracy of claims filed with the government. In the case of the criminal false claim, the statute imposes liability on "Whoever makes or presents to any person or officer in the civil, military, or naval service of the United States, or to any department or agency thereof, any claim upon or against the United States, or any department or agency thereof, knowing such claim to be false, fictitious, or fraudulent, shall be imprisoned not more than five years and shall be subject to a fine in the amount provided in this title." While there may be certain defenses for the prime, since it has a duty to ensure the claims of its subs are accurate, it can be held accountable. Filing of charges against either the prime or its subs whether criminal or civil is at the discretion of the Justice Department. In the case at hand, the prime may have a defense to responsibility depending on the facts. A contractor's responsibility to the Government is not limited just to subcontract cost issues. It would also extend to qualitative and quantitative aspects of subcontract performance - parts meeting specifications and product substitutions are a couple of things that come to mind. This is a good reminder on the need for contractor's to maintain an active oversight roll in any subcontract it awards. 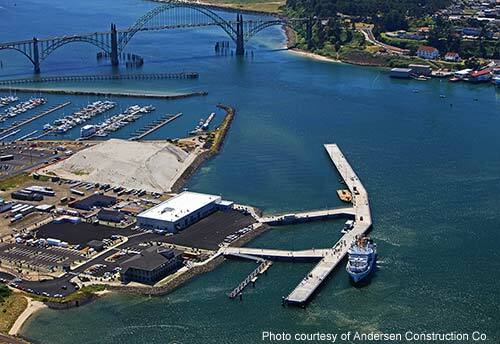 This weekend, representatives from Pacific Northwest Consultants will be participating in the National Oceanic and Atmospheric Administration's dedication cermony for the opening of its new Marine Operations Center for its Pacific Fleet in Newport Oregon. The Port of Newport won the competition for the operations center against several other west coast cities. PNWC was instrumental in preparing and supporting Newport's winning bid. "The project was accomplished early and under budget," said Ginny Goblirsch, president of the Port of Newport Board of Commissioners. "NOAA is thrilled with it and so are we. It's a beautiful facility". Congratulations to NOAA, the Port of Newport, and the City of Newport. Last month, DCAA introduced a new internal review step to its audit process. Its called the "Independent Reference Review" or IRR, and is designed to ensure quality audit reports in compliance with applicable auditing standards. In reality, the IRR is a cumbersome process that will do little to improve audit quality and will likely result in additional (probably significant) delays in issuing audit reports. But, it will make the oversight agencies (e.g. the IG organizations and GAO) happy. The IRR is a process in which an experienced auditor, who is independent of the audit, verifies all significant facts, figures and dates are correctly reported; that the findings are adequately supported by evidence in the audit documentation; and that the conclusions and recommendations flow logically from the evidence. The reason that this will add a significant delay to issuing the audit report is that the IRR occurs after the field work is completed and after the supervisor has already reviewed and approved the audit report for issuance. Adding this extra step with its herculean checklists, dispute resolution process, and certification requirement can only add to the time it takes to issue an audit report. Yesterday we referred you to a free guide to reducing the risk of fraud co-published by the AICPA, IIA, and ACFE. Among the recommended strategies is a recommendation to provide employees a mechanism (or multiple mechanisms) to report concerns about fraud or other misconduct. The August 2011 edition of the Journal of Accountancy contains a number of strategies designed to provide employees with avenues of reporting their concerns. These strategies are summarized below but you can read the entire article here. Solicit third-party interviews (customers, vendors, regulators, creditors, analysts, etc who come into routine contact with employees. Keep in mind that auditing and monitoring in high-risk areas are important tools. These strategies would need to be tailored for the size of the organization and the assessed risk that fraud could occur. Additionally, some of these might prove impractical to implement at very small contractors. The key take-away here is to understand the importance of providing employees a confidential way to report concerns. Fraud poses a critical risk to Government contractors. Not only do companies suffer the loss associated with the fraud event but if their business is Government contracting, they jeopardize their very existence if the fraud gets passed on to or affects the Government. Management can help mitigate that risk through diligent and ongoing effort to detect and prevent it. 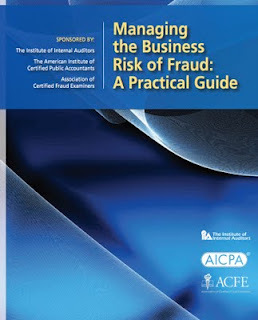 The IIA (Institute of Internal Auditors), the AICPA (American Institute of Certified Public Accountants), and the ACFE (Association of Certified Fraud Examiners) have published a guide called "Managing the Business of Risk and Fraud: A Practical Guide". This book is a free download from the AICPA. As noted, fraud is any intentional act or omission designed to deceive others, resulting in the victim suffering a loss and/or the perpetrator achieving a gain. Regardless of culture, ethnicity, religion, or other factors, certain individuals will be motivated to commit fraud. A 2007 Oversight Systems study discovered that the primary reasons why fraud occurs are “pressures to do ‘whatever it takes’ to meet goals” (81 percent of respondents) and “to seek personal gain” (72 percent). Additionally, many respondents indicated that “they do not consider their actions fraudulent” (40 percent) as a reason for wrongful behavior. principle 1: as part of an organization’s governance structure, a fraud risk management program should be in place, including a written policy (or policies) to convey the expectations of the board of directors and senior management regarding managing fraud risk. principle 2: Fraud risk exposure should be assessed periodically by the organization to identify specific potential schemes and events that the organization needs to mitigate. principle 3: prevention techniques to avoid potential key fraud risk events should be established, where feasible, to mitigate possible impacts on the organization. principle 4: Detection techniques should be established to uncover fraud events when preventive measures fail or unmitigated risks are realized. principle 5: a reporting process should be in place to solicit input on potential fraud, and a coordinated approach to investigation and corrective action should be used to help ensure potential fraud is addressed appropriately and timely. The following is a summary of this guide, which provides practical evidence for organizations committed to preserving stakeholder value. This guide can be used to assess an organization’s fraud risk management program, as a resource for improvement, or to develop a program where none exists. Criteria 13 - establish overhead budgets for each significant organizational component of the company for expenses which will become indirect costs. Criteria 21 - the material accounting system will provide for accurate cost accumulation and assignment of costs to control accounts in a manner consistent with the budgets using recognized, acceptable, costing techniques. Criteria 30 - control retroactive changes to records pertaining to work performed that would change previously reported amounts for actual costs, earned value, or budgets. At companies with contracts requiring EVMS implementation, surveillance and compliance activities represented a sizable workload for DCAA. Perhaps this will free up resources for other audit activities. There are a number of provisions in the Cost Accounting Standards (CAS) rules and regulations that exempt certain Government contracts from CAS coverage. Among these are contracts under $700 thousand, contracts to small businesses, sealed bid contracts, and more. One of the exemptions, sometimes called the "overseas" exemption or the "(b)(14)" exemption (because it is codified in 48 CFR 9903.201-1. (b)(14)) exempts contracts and subcontracts to be executed and performed entirely outside the United States, its territories, and possessions. Beginning October 11, 2011, that exemption will no longer be available and unless other exemptions apply to a particular situation, more contractors will become subject to the CAS Standards. The CAS Board cited three basic reasons for making the change. First, there is no accounting basis for the (b)(14) exemption. The place of contract execution and performance is not germane to the fundamental requirements and practices set forth in CAS used to measure, assign, and allocate the costs of contract performance. Secondly, the statutory basis originally used to justify the overseas exemption no longer exists. Absent such justification, the CAS Board must give deference to the existing CAS applicability statutes as mandatory for use by all executive agencies and by contractors and subcontractors in estimating, accumulating, and reporting costs in connection with pricing and administration of, and settlement of disputes concerning, all negotiated prime contract and subcontract procurements with the United States. Finally, the CAS Board found no evidence that the imposition of CAS in situations where the overseas exemption had been applied would create hardships for Federal agencies, prime contractors and subcontractors. The FAR Councils have issued a correction to the proposed rule they issued back in June of this year, concerning the procedures that the Government must follow in documenting contractor performance. As a result of recent congressional hearings on the matter, it became evident that the Government did not do a very good job at documenting contractor performance. In many cases, performance was not documented at all. In others, it was not in a useful format or didn’t contain sufficient relevant data. In an effort to improve upon the process, the FAR Councils issued proposed rules assigning responsibility and setting forth standards for the information to be included. Under the draft rules, the first thing each Governmental agency must do is to establish procedures for performing past performance evaluations. Generally, these procedures must somehow solicit input from technical office, the contracting officer, and where applicable, the end user. Secondly, the procedures must identify and assign roles and responsibilities to those individuals responsible for preparing both interim (if the contract is multi-year) and final appraisals. If the Agency does not identify specific individuals, the responsibility defaults to the contracting officer. Thirdly, the person(s) responsible for the evaluations must obtain information from the program office, the audit office, the end user of the product or service, and anyone else they can think of (as appropriate). The report must reflect how the contractor performed. The report should include clear relevant information that accurately depicts the contractor's performance, and be based on objective facts supported by program and contract performance data. The evaluations should be tailored to the contract type, size, content, and complexity of the contractual requirements. Small Business Subcontracting (as applicable). Each of these five evaluation factors are given ratings on a scale of one to five (exceptional, very good, satisfactory, marginal, and unsatisfactory). Each evaluation factor, as listed in paragraph of this section, shall be rated in accordance with a five scale rating system (e.g., exceptional, very good, satisfactory, marginal, and unsatisfactory). For contracts containing incentive fee provisions, the incentive-fee evaluation must be included. The same goes for award fee information. Agency evaluations (both negative and positive) are to be provided to the contractor as soon as practicable after completion of the evaluation. Contractors get at least 30 days to submit comments, rebutting statements, or additional information. Any disagreements are considered by a person at a level above the contracting officer however, the ultimate conclusion on the performance evaluation is a decision of the contracting agency. Completed evaluations are not be released to other than Government personnel and the contractor whose performance is being evaluated during the period the information may be used to provide source selection information. Disclosure of such information could cause harm both to the commercial interest of the Government and to the competitive position of the contractor being evaluated as well as impede the efficiency of Government operations. Performance information stays in the Government database for three years (or six years for construction and architect-engineer contracts). For the past few days, we have been discussing audits of direct costs that are performed as part of the review of contractor annual incurred cost submissions. As previously discussed, some contractors are surprised when the contract auditor makes inquiries concerning claimed direct costs, thinking that their incurred cost submissions are primarily about indirect costs. But, at the end of the day, an audit of an incurred cost proposal is opining on the allowability, allocability, and reasonableness of all costs charged to flexibly priced contracts. Previously, we discussed material costs, direct labor costs, and ODCs (other direct costs). Today we conclude this series with a discussion of subcontract costs. For the purpose of this discussion, the term "subcontract" means an auditable subcontract, purchase order, or other form of agreement under which materials or services are to be furnished on a flexibly priced basis to a prime contractor under a flexibly priced contract subject to audit. As discussed earlier in this series, flexibly priced contracts include all cost-type, fixed-price-incentive, and fixed-price-redeterminable contracts, orders issued under indefinite delivery contracts where final payment is based on actual costs incurred, and portions of time-and-material and labor-hour contracts. The responsibility of the prime contractor for managing its subcontracts is stated in FAR 42.202(e)(2). Essentially, the prime contractor is primarily responsible for subcontract award, technical and financial performance monitoring, ensuring that indirect rate proposals and annual rate adjustments are submitted on a timely basis, and payment to the subcontractor for the work accomplished under subcontract terms. To accomplish this responsibility, the prime contractor should have adequate internal controls to identify and notify the Government of auditable type subcontracts and intracompany orders under auditable type Government contracts, and to assure that subcontract/intracompany costs are allowable, allocable, and reasonable. Prime contractors must notify the Government of awards of subcontracts (as well as intracompnay orders) as soon as practicable after award, and as part of the prime contractor's annual incurred cost proposal submission. The schedule of subcontracts (known as "Schedule J" in the DCAA's standardized incurred cost model) submitted with the proposal should include the prime contract number, subcontract number, amount, and type of order (e.g. CPFF, T&amp;M, etc). Provide either the Government or the prime contractor access to the subcontractor's books and records for the purposes of performing the annual incurred cost audit. Failure to maintain adequate controls could impact a contractor's ability to stay on the direct billing program. It is the prime contractors responsibility to audit its subcontracts. The Government auditor will review the adequacy of the work performed by the prime contractor. The contract auditor has a pretty good idea of what is required in an audit so when it looks at the work performed by the prime contractor, it is expecting to find something that looks similar to the kind of audit it would perform, if it were to perform one on the particular subcontractor. the contract or subcontractor has a substantial financial interest in the other. The past couple of days, we've been discussing audits of direct costs included in contractors' annual incurred cost submissions. Often times, Government contractors believe that audits of incurred cost proposals are limited to review and analysis of indirect rates. Not so. The traditional incurred cost audit encompasses all costs charged to flexibly priced contracts, be they direct or indirect. Today we will discuss ODCs (Other Direct Costs). The contractor has been consistent in allocating such costs to commercial and Government work. Item 4, above is one area that gets a lot of attention from contract auditors. Auditors are trained to discern disparities in accounting practices that benefit commercial work at the expense of Government contracts. Sometimes reviews of ODCs fall outside the expertise of the contract auditor. In those cases, the auditor will request technical assistance from or through the contract administration office or the contracting officer. For example, technical advise may be required when the contractor manufactures special tools or incurs plant rearrangement costs which are charged to ODC, or when packaging costs represent a significant amount of ODCs. The overall objective of audits of contractor annual incurred cost submissions is to render an opinion on the propriety of costs charged to flexibly priced (e.g. CPFF, CPIF, FPI, T&amp;M, etc) Government contracts. The audit procedures include tests of both indirect and direct costs. Many contractors have the mistaken impression that auditors are only reviewing indirect rates during the incurred cost audit. This is understandable because so much of the standard incurred cost submission is focused on the development of indirect cost pools and their allocation bases. But, at the end of the audit, the auditor is expressing an opinion on both direct and indirect costs charged or allocated to contracts. Last Friday, we discussed the primary audit objectives for material costs. Today, we discuss the audit of direct labor costs which is usually, far more significant, in terms of dollars, than are material costs. A significant part of the audit of labor costs occurs before the incurred cost submission is prepared and submitted. These are the Government's infamous floorchecks (or, observations of work areas). These are unannounced visits to contractor facilities to interview employees and compare timesheet entries with work actually being performed. Floorchecks are a major component of the audit of direct labor costs. Floorchecks are performed in “real-time”, that is, concurrent with the actual work being performed. The purpose of a floorcheck is to verify that contractors have policies and procedures to ensure the propriety of labor costs being charged to Government contracts. Deficiencies disclosed in a floorcheck are often the result of poor internal control systems or compliance issues. Deficiencies could lead to payment withholds, as discussed previously in this blog. Most Government contractors are familiar with the FAR (Federal Acquisition Regulations) requirement to submit annual incurred cost submissions. These submissions set forth contractors' calculations of final indirect expense rates (e.g. fringe benefits, overhead, General and Administrative, etc) as well as tabulate direct costs by contract. During the audit of incurred cost submisisons, auditors are testing for allowability, allocability, and reasonableness of both direct and indirect costs. This sometimes surprises contractors, especially because so much of the focus of the submission is on indirect costs. However, at the conclusion of the audit, the auditor is attesting to the propriety of both direct and indirect costs incurred during the fiscal year under audit. Was it needed for the contract? Was it charged and billed in a reasonable relationship to its use in the manufacturing process. Was it purchased at a reasonable price? Was it used on the contract? If contract subject to CAS (Cost Accounting Standards), were the charges in compliance with CAS. Was it accounted for properly as to initial charge, transfer in or out, and residual value. Additionally, audit guidance also instructs auditors to be alert for purchases from "related" suppliers or subcontractors, preferential treatment, and unwarranted sole-source purchases. Four senators have introduced legislation intended to improve the Government's ability to recoup money that it has erroneously to Government contractors. The proposed legislation adds several features to the existing law on recouping improper payments. First, it would prevent agencies from relying only on voluntary disclosure of improper payments by contractors. In various hearings, these senators concluded that the government's estimates of improper payments were anemic and superficial. Secondly, it would mandate that each agency set up an audit coordinator for recovery audits. Thirdly, it would require a nationwide "do not pay" list. And finally, it would require agencies to produce documentation to prove a payment was correct. Many contractors have already been subjected to one or more "payment recapture audits". From our limited perspective, it does not seem like the Government is getting "bang for the buck" in these audits. No contractor that we know of has had to refund erroneous payments. According to Shay D. Assad, the Director of Defense Pricing, most of the policy and execution plans are already in place and although progress is being made toward achieving those goals, it will take 18 to 24 months to implement the plans among 26,000 contractors and three million contract actions. We'll just have to take their word for it. Back in 2006, FAR was revised to expressly authorize the use of time-and-materials (T&M) and labor-hour contracts for commercial services under specified conditions as well as policies regarding payments under those contracts. The proposed change affects payments under T&M contracts that are terminated for cause. The proposed change will, for contracts terminated for cause, allow the contractor to be paid for work performed prior to the termination for cause, including work not delivered or accepted by the Government, less applicable profit. When supplies or services do not conform to contract requirements, the Government generally rejects the supplies or services. The Government ordinarily provides contractors an opportunity to correct or replace nonconforming supplies or services when correction or replacement can be accomplished within the required delivery schedule. Correction or replacement is generally made without additional cost to the Government. However, certain contract types, including T&M contracts, generally require the Government to pay additional costs for replacement or correction, but no additional fee is paid. Payment for replacement or re-performance is consistent with the ``best efforts'' nature of T&M contracts. The Government generally pays for replacement and re-performance on both commercial and noncommercial T&M contracts. We've come to the last part of our short series on suspension and debarment. The Government's decision to suspension or debarment depends primarily on the sufficiency of the evidence. Suspension requires adequate evidence while debarment requires the preponderance of evidence. A suspension lasts up to 18 months while debarment lasts up to three years. Either one can be extended if litigation is going on that is related to the activity causing the action. Both suspension and debarment actions can be mitigated if a contractor takes remedial action and seems contrite. The most effective steps a contractor can take to avoid or protect against suspension and debarment are actions that demonstrate they are responsible contractors. Here are a few rules for guarding against a future suspension or debarment. Develop and maintain effective standards of conduct and an effective internal control system. Take appropriate disciplinary action against individuals in your organization that are responsible for wrongdoing. Implement correct actions following the discovery of wrongdoing. Continuously review internal control procedures and revise when necessary. Implement an ethics training program (now contractually required in many contracts). Develop an internal program that illustrates management's commitment to ethical behavior. Set the proper tone at the top. Establishing these rules is no guarantee that a contractor can avoid a suspension or debarment. Because of this fact and because the financial effect of either action can be devastating, contractors should involve legal counsel in any matter that could lead to a suspension or debarment.